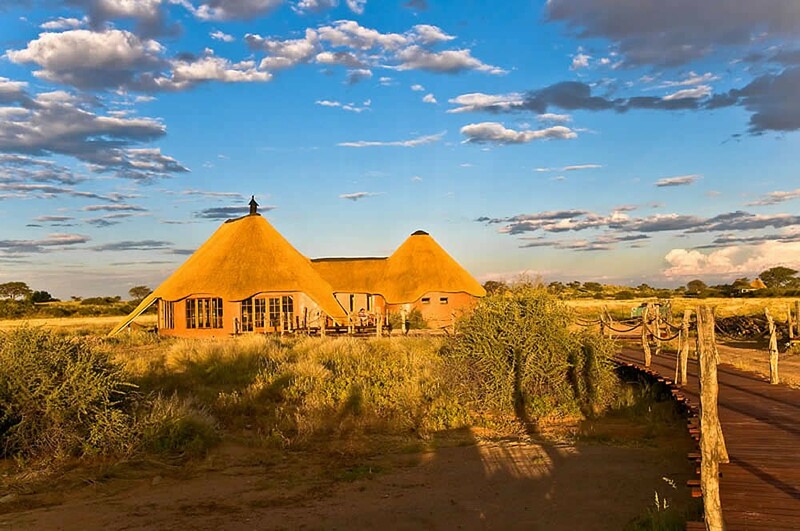 Kalahari Red Dunes Lodge is set on a natural island in the dry lake (Vlei). 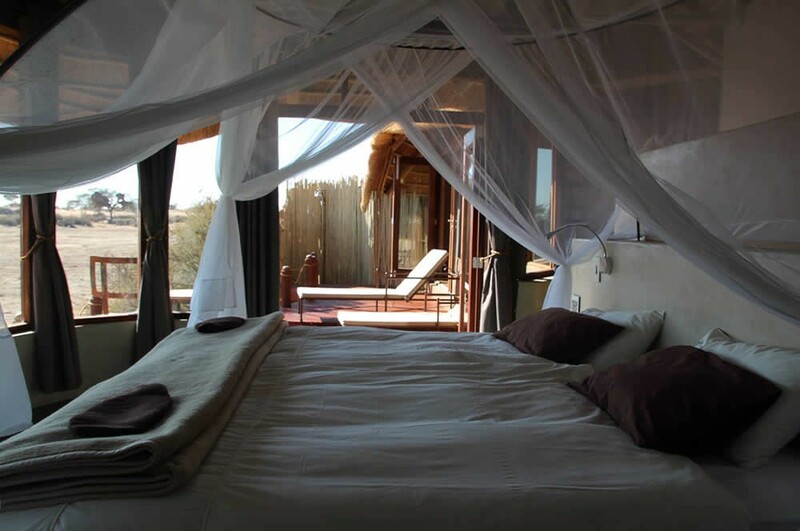 It features a traditional African thatched roof and was built in traditional African style. It can only be reached via a 120m wooden boardwalk. 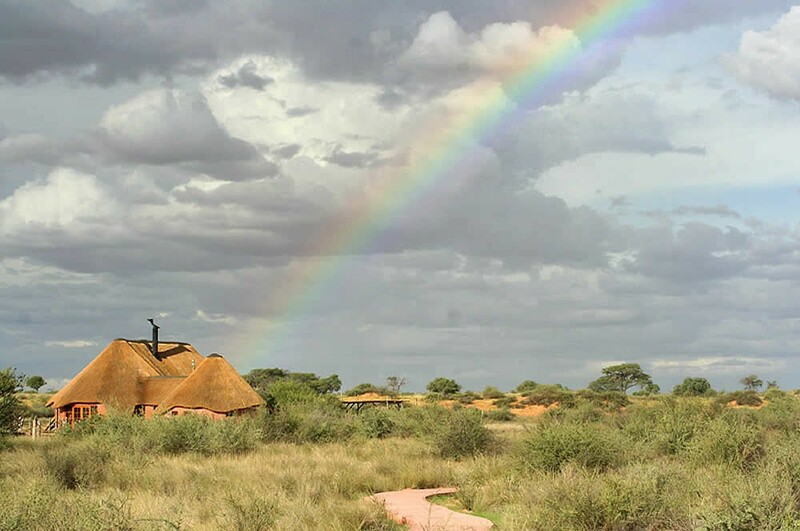 Enjoy the Kalahari desert from one of twelve individual guest houses. 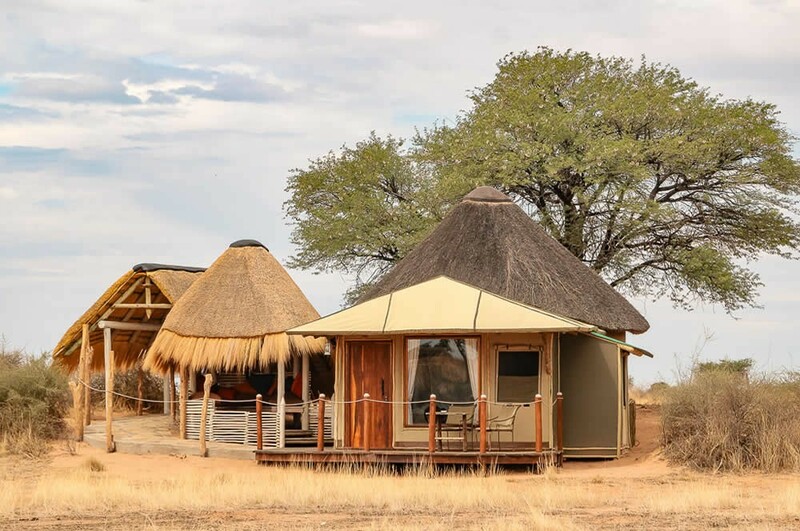 Carrying the names of the largest wild animal species of the reservation, the stilted guest houses are arranged around a Vlei, a natural dry lake. All walking paths from the guest houses to the main building are paved, barrier-free, and well-lit. 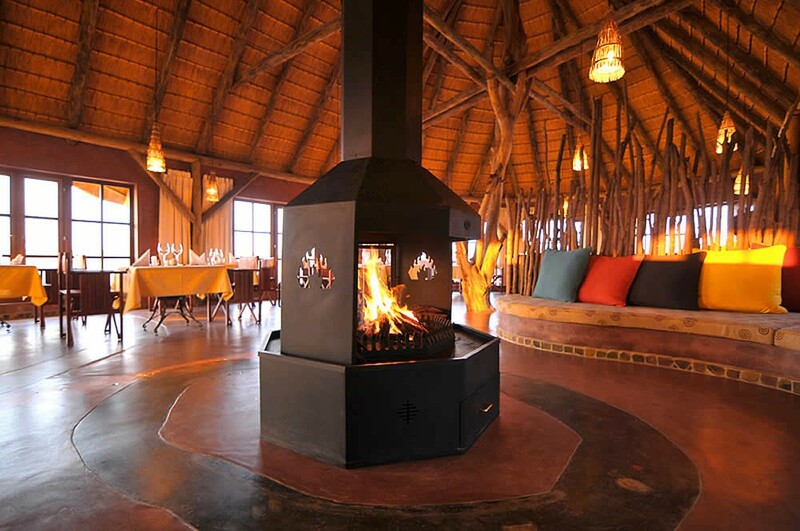 Exterior walls made from canvas and the traditional African thatched roofs guarantee an excellent indoor climate even with high outside temperatures. All bathrooms are built as solid construction. The living space of each guest house varies from 50 to 60 sqm. During the summer season, you can have breakfast on our large terrace. Enjoy the extensive buffet and ask the cook to prepare omelets according to your wishes. 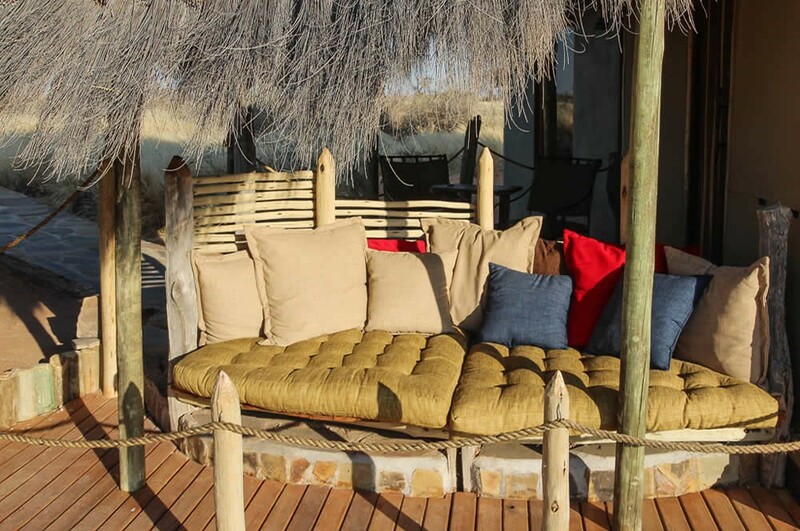 During the Namibian winter, mornings and evenings are too cool to sit outside. Then, the open fireplace will keep the restaurant nice and warm. The African atmosphere will captivate you during dinner. Wind down and enjoy our comfortable lounges, panoramic views, and classy teak terraces. We serve European dishes with African influences by adding fresh home-grown herbs and fruits. 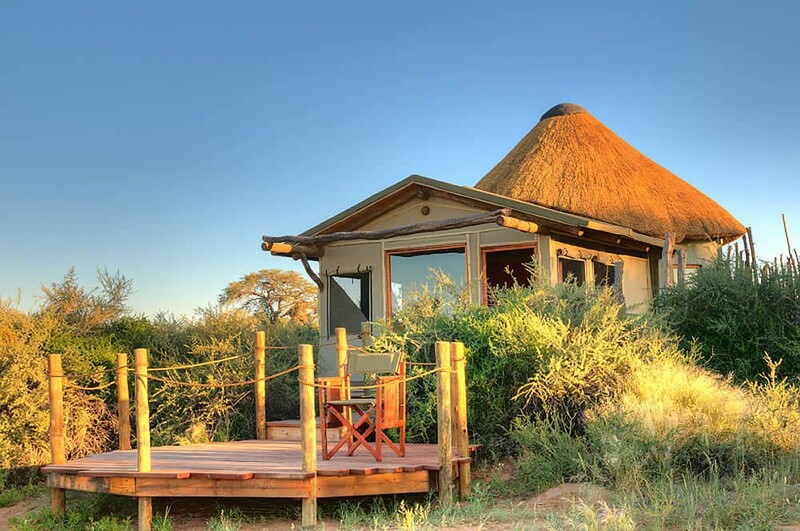 During the season of the Kalahari truffles, our cooks will add this extraordinary culinary experience to the menu. We keep a large selection of good to excellent wines from South Africa’s most distinguished wine-growing areas in well-tempered wine fridges. A variety of grapes offers wine connoisseurs the opportunity to enjoy well-loved wines or get to know new tastes. As the name indicates, the new Camelthorn beer is perfect for our lodge underneath all the surrounding camel thorn trees. However, it was the excellent taste of this beer brewed by a Namibian master brewer according to German purity requirements that persuaded us to include the beer in our menu. Enjoy a fresh unfiltered or clear draft beer to cool down after a hot and sunny day. Feel free to let us know your needs. Kalahari desert: infinite chains of red sand dunes alternate with green valleys. The lovely view will charm every visitor. 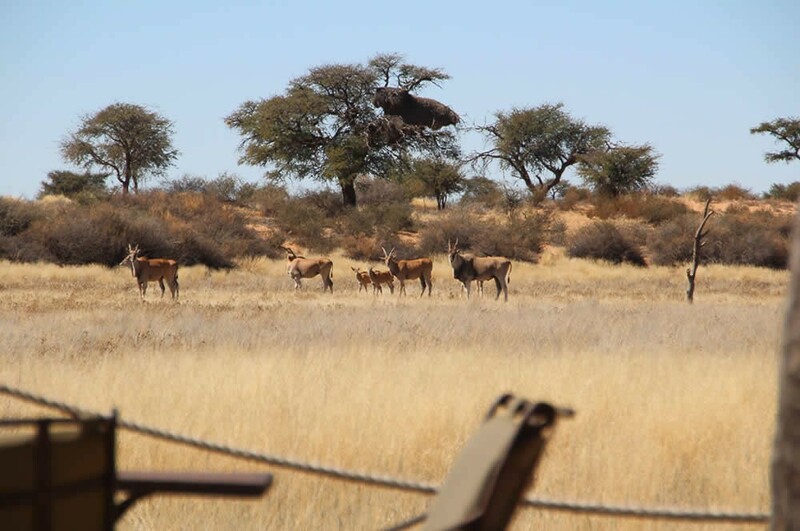 It is the home of oryxes, springboks, and kudus. Great Karoo desert: vast grass steppes, dry river courses with abundant water bank vegetation, small dry lakes, and tree savanna. Giraffes, zebras, gnus, elands, impalas, and nyalas prefer this region. Travel south on the B1 for approx 7 km and the entrance to Kalahari Red Dunes Lodge is on the left.